When it comes to vacation rentals, Oregon coastal towns such as Lincoln City offer some of the most accommodating, comfortable and luxurious homes to serve as home base for getaways of all sorts. There are Oregon vacation rentals to suit your needs whether you’re planning a romantic weekend at a condo for two, or a weeklong excursion with your family or a group of friends. But what is there to do once you get there? There are, of course, all the things that the local beaches offer from beachcombing to whale watching to late night campfires. And the city is filled with shops, restaurants, and entertainment venues. But that’s far from all there is to do. Lincoln City hosts exciting events year-round, so whenever you make it here you’ll find something to tickle your fancy. Here are just a few of the fun events coming up as October begins. 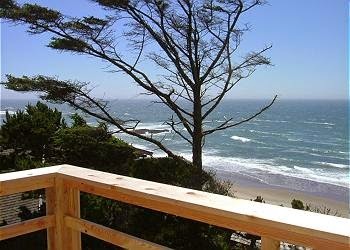 Oregon Beach Home, and Condo Rentals Available. Call 541 -232-5984 to reserve your room today! This Friday, October 2 and Saturday, October 3, the Chinook Winds Casino Resort will host George Thorogood & Los Lobos starting at 8 p.m. each night. Get your tickets, which range from $40-$55, as soon as possible before they sell out! This Saturday, October 3 Lincoln City’s Culinary Center will host a Wild Mushroom Cook-Off from 11 a.m. – 2 p.m. Admission is free at the door, and tasting-sized portions of the culinary creations will be available for a nominal fee. Lincoln City’s Cultural Center will host the “Artober” Brewfest this Saturday, October 3 from 11 a.m. – 6 p.m. The brewfest will celebrate local breweries and artisans while keeping you fed and entertained with fine foods, vendors, and live music. Most importantly, you’ll be able to sample a whole lot of beer! If you’re looking for an activity that’s fun for the whole family, head to the 33rd Annual Neskowin Valley School Harvest Festival on Saturday, October 3 from 10 a.m. – 5 p.m. The annual event will feature children’s activities, live music, a silent auction, an artisan market, great food, and beer from Pelican Brew Pub. Is fine art more your thing? The Lincoln City Cultural Center will host an opening reception for an exhibit entitled “Nature Impressed” on Friday, October 9, from 5 p.m. – 7 p.m. The exhibit will feature the work of four artists working with natural printing techniques on clay, glass, paper, and wax materials. This twice-yearly kiting event returns to the D-River Wayside this Saturday, October 10 and Sunday, October 11 from 10 a.m. – 4 p.m. You will find a world of fun for kite enthusiasts right on the beach in Lincoln City, and admission is free of charge! Now all you need is the right vacation house or beach condo rental. Lincoln City, OR will do the rest to keep you happy, entertained, and right at home during your stay. Looking for a luxurious Oregon vacation house to accommodate a big group? If the answer is yes, then we’ve got the ideal beach house rental to suit your needs. 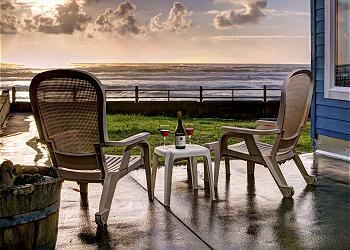 The Sandgate in Lincoln City, OR is the perfect place for your gang to get away this fall. Of all the beach vacation rentals in this idyllic seaside town, this rental home is one of the few that boasts two stories and room to sleep up to 10 people. So gas up the car, pack your beachwear and a sweater, and get ready for a beautiful time away in Oregon’s beautiful central coast area. Whether you are a family or a group of friends, this beach house is your ticket to campfires, beach combing, whale-watching and more, with coastal access a mere 15 feet from your front door! Park right inside the one-car garage, and find space for a maximum of two additional cars outside. The Sandgate sleeps as many as 10 people in four bedrooms (two with ocean views) that feature one king bed, two queen beds, two full beds, and one twin bed. There are also two well-appointed bathrooms for your beauty and hygiene needs, offering a bath tub, shower, hair dryer, and fresh linens. A washer and dryer are on-site to keep your clothes clean as well. The dining area serves eight, and you can cook up a storm with a kitchen featuring modern amenities such as granite countertops, cookware, utensils, coffee maker, toaster, microwave and stainless steel appliances including an oven, stovetop, dishwasher, and refrigerator. While staying at The Sandgate, guests of all ages will stay entertained with a large living room that features a wifi connection, flat screen television with HBO, gas fireplace, and spectacular view of the sand and sea. When you’re ready to step outside, you’ll find a front deck, sea view balcony, private courtyard, charcoal bbq, and hot tub. And, of course, the beach is just right outside your door at this perfectly positioned beach home rental. Lincoln City, OR features numerous entertainment options well. Mist, a popular restaurant offering its famed seafood and late-night entertainment, is only a block away. You can get to the nearby Chinook Winds casino in as little as 10 minutes if you walk along the beach, or in six blocks if you follow city streets. Other nearby businesses include additional restaurants, grocery stores, and a golf course, outlet mall, hardware store, craft shop, movie theatre, glass blowing studio and much more. Museums, a theatrical venue, and the historical society are also nearby. When you’re ready to book this beach home rental, Lincoln City OR will be waiting. It’s always a perfect time of year to visit, and there’s always something to enjoy here depending on your wants and needs. It’s always a good time to book one of the many beach vacation rentals Oregon has to offer for a seaside getaway, but this September is an especially opportune time to make a plan for a few days away. As summer winds down and we slip into fall, A-1 Beach Rentals of Newport, Oregon is offering $100 off all stays at the splendid Blue Dolphin during the entire month of September. Just make sure to mention the September Special at your time of booking and you’ll enjoy a sweet discount for an even sweeter ocean view at one of Newport’s most charming Oregon beach house rentals. Vacation rental house. Sleeps 13, 4 bedrooms, 3 bathrooms. The Blue Dolphin is one of the preferred Oregon vacation homes for numerous reasons. This one-story home features an open floor plan, three king beds, one queen bed, two sleeper sofas, three bathrooms, a private media room with kitchenette and bathroom, and an attached studio. In addition to the living room with gas fireplace and kitchen with all the expected amenities, guests also have access to a dining table with seating for eight, garage, front deck, charcoal grill, hot tub, and washer/dryer. With fresh linens and wifi connection, you and your loved ones will feel right at home. The best part, however, might just be the exceptional view and easy coastal access. While there are plenty of beach and condo house rentals in Lincoln City, this rental is one of the most conveniently located homes with one of the most stunning sunset views. While staying at the Blue Dolphin, guests can stay in and barbeque, enjoy the hot tub, do some whale-watching, or walk along the stunning beach that’s only steps from the home’s front door. Families will also enjoy nearby attractions such as a miniature golf center, move theatre, playground, aquatic center, and the Newport Aquarium. If you’re looking for some culture, there are plenty of museums, live theatre, glass blowing studios, the Lincoln City Historical Society, the Historic Bijou Movie Theatre, and a dazzling casino. Lincoln City and neighboring Depoe Bay offer numerous shops, restaurants, grocery stores, and other services as well. It all starts with one of the area’s finest beach vacation rentals. Lincoln City will offer the rest, and before you know if you’ll be on that ideal getaway you’ve been looking forward to, even if you didn’t think you had the time. And with September savings, you may be surprised with just how far your budget will stretch! 4 bedrooms, 2 bathrooms. No pets allowed. Through the end of September you can celebrate Oregon’s unique geology with a free exhibit at the North Lincoln County Historical Museum. The museum is open from 11 a.m. to 5 p.m. Wednesday through Sunday. Looking for a little culinary culture? Then reserve your place at the Late Summer Harvest Demo to take place from 5 p.m. to 8 p.m. this Friday, September 11 at the Culinary Center in Lincoln City. For $55 you’ll learn cooking secrets from culinary masters and enjoy a delicious meal paired with wine. Lincoln City will be filled with classic cars this Saturday, September 12, as the Cruisin’ the Bay Car Show takes over the parking lot at The Bay House Restaurant on SW Hwy 101. Admission is free to the public, or $10 for each show vehicle entry beginning at 9 a.m. Trophies will be awarded at 2 p.m. and live music will keep the crowds entertained throughout the event. If classic cars aren’t your thing, perhaps bacon and beer on the beach might be more enticing? The Beach, Bacon and Brewfest at the Chinook Winds Casino Resort (lot 57) will also take place this Saturday, September 12, from 10 a.m. until 4 p.m. As many as 20 craft breweries will be represented, the charity bacon cook-off will feature $1 “bacon bit” samples, and Unlikely Saints will play live music all day. Oregonians will welcome the return of Chinook and Coho on the Salmon River this Sunday, September 13 at Westwind, which is just a ferry-ride away from Knight Park in Lincoln. The event, which runs from 1 p.m. to 5 p.m., will feature boat tours of the estuary, beach games, art, guest speakers, science demonstrations, and a salmon bake for a suggested donation of $10. Come celebrate the 50th Celebration Parade in Lincoln City this Saturday, September 19 at 10 a.m. The annual event welcomes locals as well as visitors along Hwy 101, starting at the Cultural Center and ending at the Community Center, followed by a picnic at nearby Kirtsis Park. As mentioned above, these are only a few of the things you can do while staying in one of our beach vacation rentals. Lincoln City is always abuzz with activity. For more information about these events and everything else going on around Lincoln City this month, just head over to OregonCoast.org and check out the event calendar. We can supply the Oregon beach house rentals, but it’s up to you to decide how you spend your days once you get there!